How does a person maintain optimal health when seasonal and dietary allergies are all around us? Let’s explore the role of inflammation and allergies as well as natural ways to calm, stabilize, and strengthen the tissues affected by them. Under normal circumstances, inflammation is a desirable and healthy response. It is triggered when body tissues are injured by physical trauma (i.e., a blow), intense heat or cold, irritating chemicals, or infections. Healthy inflammation prevents the spread of damaging agents to nearby tissues, stimulates the disposal of unwanted pathogens and damaged cell debris, and sets the stage for repair of the injured tissues. Allergies, on the other hand, are not of the healthy variety. Allergists define allergies as the clinical expression of atopic diseases, including asthma, rhinitis, eczema, and food allergy. In other words, an individual’s body reacts to foreign substances like pollen as a threatening substance and responds to the perceived danger in an excessive way. Allergies can manifest as stuffy nose, itchy eyes, inflamed throat, asthma, sinus and lung congestion, irritated digestive tract, hives, and urinary tract inflammation. Unhealthy inflammation quickly escalates and, in some cases, can become life threatening. Allergic triggers include pollen, food, prescription and over-the-counter medication, smoke, pet dander, mold and fungus, dust mites, cockroach droppings, insect stings, latex, and fragrances. 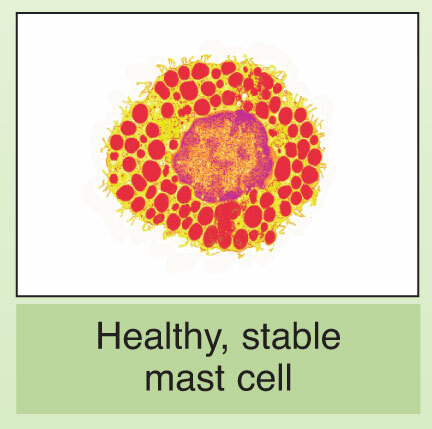 Mast cells are the primary cells responsible for initiating the misguided immune response to these triggers. Negative lifestyle factors such as high stress; lack of exercise; poor sleep; high fat, low fiber diet; and alcohol, drugs or tobacco use trigger the production and release of pro-inflammatory compounds. In the presence of these compounds, mast cells develop a hair trigger reaction. As negative lifestyle factors increase, our immune system’s resistance decreases. The mast cells become increasingly hyper vigilant and hyperactive. Over time, these negative lifestyle factors stimulate the surge of mast cells present in mucosal tissues by a factor of ten. 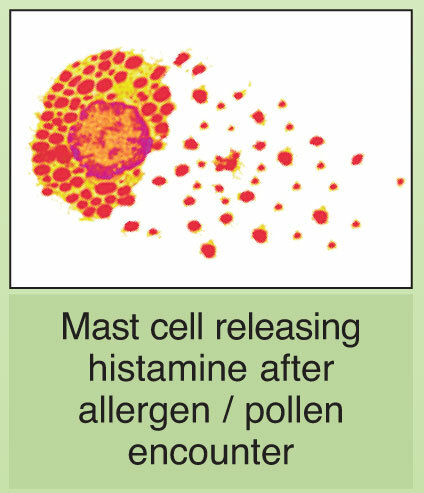 Eventually, all it takes is a grain of pollen entering the nose and, instead of being washed away by mucus, the mast cells respond to this minor irritation by releasing massive quantities of histamine and other pro-inflammatory substances in the surrounding tissues. Histamine and other inflammatory molecules create immediate, powerful tissue reactions. In short order, local edema (swelling), warmth, redness, pain, and itching occurs and the person experiences symptoms such as sneezing, red and itchy eyes, drippy nose, post nasal drip, stuffy sinuses, itchy skin, gastrointestinal distress and irritated bladder. Additionally, the person may feel tired, nauseated and foggy brained. Allergy ReLeaf® System (ARS) is a dietary supplement designed to maintain a healthy allergen response in the respiratory and digestive system as well as in the skin. Unlike drugs that stop the action of histamine and other inflammatory compounds after they have been released into the tissues, ARS prevents their release in the first place. It strengthens and stabilizes mast cells and calms their response to airborne pollens, allergenic foods, and other allergenic substances. ARS supports and normalizes adrenal gland function ensuring calm, healthy inflammatory responses. Taken over time, Allergy ReLeaf® System normalizes the number of mast cells found in mucosal tissues. ARS is useful in allergic rhinitis, hay fever, chronic sinusitis, itchy and inflamed eyes, chronic states of asthma, chronic bronchitis, food allergies, chronic inflammation of the mouth, stomach and intestines, hives, chronic skin rash and eczema. Allergy ReLeaf® System helps your body meet seasonal and dietary challenges. The program’s success hinges on two synergistic formulas: Allertonic® and Quercetin AllerReLeaf®. They work in a hand-in-glove way and support each other’s action. Four key herbs in Allertonic®, (Stinging Nettle herb, Horsetail herb, Mullein leaf, Plantain leaf) are processed while fresh (never dried) to retain their full medicinal properties. This is a critical step since their essential oils and other fragile constituents are lost, evaporated, or destroyed during the drying process. To maximize the potency of the formula, the dried herbs (Licorice, Eyebright, Horehound, Osha, and Elecampane) are ground on the same day they are extracted. Extracting fresh and dried herbs in specific, yet different, ways ensures that all of the anti-allergenic constituents are retained in the final product. Fresh Stinging Nettle (Urtica dioica) herb has been shown in a double-blind study to reduce the symptoms of allergic rhinitis. It does so by decreasing the production of the inflammatory compounds cyclooxygenase and 5-lypoxygenase and reduces the release of histamine. Licorice (Glycyrrhiza glabra) root possesses excellent anti-inflammatory activity. It prevents the excessive migration of white blood cells into sites of inflammation. Licorice increases the absorption or utilization of the other herbs found in a formula. For example, Horehound and Mullein are more effective in bronchial inflammation when combined with Licorice. Eyebright (Euphrasia roskoviana) stabilizes the fixed antibodies found in the eye and sinus tissues Horehound herb is useful for individuals who have an allergic predisposition that may manifest as asthma. 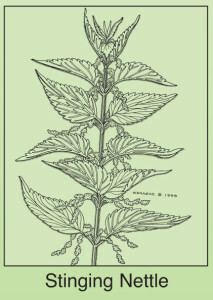 Horehound (Marrubium vulgare) herb is useful for individuals who have an allergic predisposition that may manifest as asthma. Osha (Ligusticum porteri) root hydrates dry mucus, stimulates ciliary action to remove the mucus from the lungs, and reduces inflammation of the upper and lower respiratory tract. Elecampane (Inula helenium) root, when taken regularly, calms and stabilizes mast cells more effectively than the antiallergic drug disodium cromoglycate. Its richness in antibacterial essential oils prevents sinus and respiratory infections. Fresh Horsetail (Equisetum arvense) herb contains bioavailable silica that strengthens respiratory tissues under stress. Fresh Mullein (Verbascum thapsus) leaf possesses significant anti-inflammatory activity specific to the respiratory system. Fresh Plantain (Plantago major) leaf decreases inflammation and spasms of the respiratory system. showed that quercetin’s effect was almost twice as effective as the powerful antihistamine drug sodium cromoglycate. A research group headed by Busse showed that quercetin inhibits inflammatory processes by stabilizing respiratory membranes and acts as a potent antioxidant. 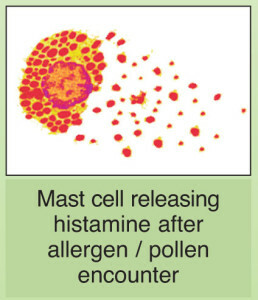 It stabilizes mucous membranes and prevents mast cells from releasing histamine. Quercetin decreases the release of intestinal prostaglandins, stops the release of inflammatory compounds from intestinal and respiratory mast cells, scavenges free radicals, and inhibits irritability of the muscles of the intestines. Recently, Persian scientists demonstrated that quercetin prevents anaphylaxis induced by peanuts in rats. Vitamin C (200 mg) is used for its antihistamine properties. It prevents the secretion of histamine by white blood cells and increases its detoxification. As vitamin C blood plasma levels decrease, histamine levels have been found to increase exponentially individuals prone to allergy or inflammation should increase their intake of vitamin C Pantothenic acid (100 mg) (A.K.A. Vitamin B5) supports the health of adrenal gland, sinus and nose tissues. It is considered to be an anti-stress vitamin because of its pivotal role in ensuring healthy adrenal function and cellular metabolism. Naturopathic physicians recommend pantothenic acid supplementation to treat seasonal rhinitis as well as food allergies. As early as 1958, a clinical trial demonstrated that pantothenic acid reduced blood eosinophils levels, a marker of allergic symptoms, and reduced skin reactions to allergens. Curcurmin (95% curcuminoids, 50 mg), a standardized extract of turmeric (Curcuma longa), is a potent anti-inflammatory agent. Curcumin has been shown to be as effective as the drug phenylbutazone for acute inflammation. While phenylbutazone and NSAIDs are associated with significant toxicity, curcumin has none. Because curcumin is less active when adrenal glands are not functioning properly it’s a good idea to take curcumin with pantothenic acid. Bromelain (2,400 GDU, 50 mg) is a protein-digesting enzyme that increases the absorption of quercetin in the intestinal tract, reduces the symptoms of acute sinusitis, inhibits the production of pro-inflammatory prostaglandins and increases the biosynthesis of anti-inflammatory prostaglandin E1. Preparation and Dosage: Acute: Take one Allertonic® softgel and one Quercetin AllerReLeaf® tablet every two to three hours with water until comfort is achieved or as directed by your health care professional. Noticeable comfort is attained within the first or second day. Then switch to Ongoing use. Ongoing: Once comfort is attained, take one Allertonic® softgel and one Quercetin AllerReLeaf® tablet three times a day with water. This regimen can be followed when dealing with chronic allergies. Proactive: Two months prior to seasonal challenges, take one Allertonic® softgel and one Quercetin AllerReLeaf® twice a day with water. Best results are achieved when these two products are taken together. Contraindications, Side Effects and Toxicity: There are no known side effects, contraindications or toxicity associated with Allertonic® softgels and Quercetin AllerReLeaf® tablets.